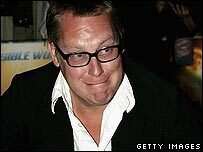 Comedian Vic Reeves has been signed up as the new presenter of the Sky One show Brainiac: Science Abuse, replacing Top Gear's Richard Hammond. Hammond, who hosted the first four series of the anarchic science programme, is now involved in negotiations for new projects. Reeves said he was "absolutely thrilled" at hosting the 12-episode series, which starts in the new year. The series will still feature Jon Tickle and Charlotte Hudson. "Science is my God and my ultimate goal in Brainiac is to destroy the moon with dynamite," Reeves said. Emma Read, Sky's commissioning editor for factual entertainment, said: "Brainiac continues to go from strength to strength. "We thank Richard Hammond for all his fantastic work on the series and we're excited that Vic is now taking us into a new era. His anarchic brand of humour will be perfect for the show." Reeves became a cult hit as a one half of a double act with Bob Mortimer in shows such as The Smell of Reeves and Mortimer and Shooting Stars.